Timothy Garton Ash on the fate of free speech in a new era of authoritarianism. A conversation with Timothy Garton Ash. Donald Trump speaks during a rally in San Jose, California, on Thursday. The fate of free speech is especially fraught in our current political moment. 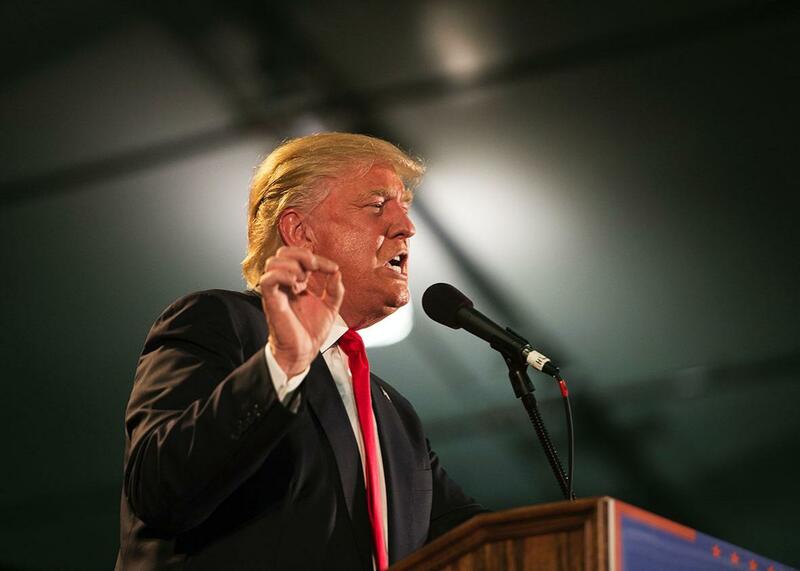 The rise of Donald Trump may seem shocking and unprecedented, and to some extent it is. But Trump’s success mirrors the entrenchment of increasingly authoritarian rulers and politicians in countries all across the world, from Turkey to Russia to India to Poland to Hungary. In all of these countries, demagogues have stigmatized ethnic or religious minorities, fueling fear about the rise of hate speech and violence. Where does that leave our cherished principle of free speech? I spoke with Garton Ash by phone. We discussed, among other things, “safe spaces” on college campuses, violent protests at Trump’s rallies, and the single biggest threat to free speech in the 21st century. The interview has been edited and condensed for clarity. Chotiner: Have your own opinions on free speech changed over time? Garton Ash: It’s very boring. I’ve always been a small “l” liberal and seen the value of free speech. Undoubtedly, in working on this subject, I have come to see and understand certain new challenges to free speech. One is what I call “the assassin’s veto.” People saying, “If you say that, we will kill you.” Arguably that’s been happening through history, but the connected world means that the danger is enormous. Another example would be what I call the ethics of algorithms. These decisions that are being made deep in the innards of Facebook or Google which are determining, in really important ways, what we see and what we don’t see. Again, the basic principle isn’t new, but the challenge is new. Does the rise of authoritarianism in so many different countries, and the corresponding threat to minorities, make you think differently about these issues? I have a very clear view, which is that mature democracies should try to go beyond hate speech laws. It was different in some earlier situations, like Britain in the 1960s, when kids of Pakistani origin were routinely being beaten up on the way home from school. A law was passed, which if you look at it looks like a hate speech law, but the justification was about the probability of violence, which I think is where we should draw the line, and not the much, much broader category of hate speech. The category I use a lot in the book is dangerous speech rather than hate speech. That’s speech that actually significantly increases the probability of violence in a particular context. Much of the push for hate speech laws is old-fashioned and simplistic sociology. It sort of looks back to the first decades of immigration into Europe when you had extremely well-defined, small minorities against whom there was enormous prejudice. But if you take a city like London, it’s way beyond multiculturalism, where there’s massive diversity not just in individual families but in individuals. People have multiple identities. It simply doesn’t work to say, “Oh, here we can identify a single vulnerable minority. They must be entitled to special treatment because it’s a genuinely diverse and multicultural society.” In some cities in England the people who have the lowest level of educational attainment and often the highest level of unemployment are the poorly educated white working class. I think the framework breaks down when you look at a genuinely multicultural reality. I’m very much with the First Amendment tradition on this. I don’t think you should try to enforce civility by law. There is very little evidence that European countries with hate speech laws have any less phobia or racism. Take France, for example. You have “monkey” chants at French football matches, although the country absolutely has lots of hate speech laws, so I don’t think that’s a way to do it. I think you have to do much more of it in civil society. Here’s a question: Why isn’t there more of a push back in civil society among the electorate, in the media, against people who are spouting whatever they say about Mexicans or Muslims or Jews or whoever it may be? One possible response to the rise of these authoritarians is what we saw the other night at the Trump rally in San Jose, California, with calls to stop Trump from speaking and even violence. Well, it’s the heckler’s veto, isn’t it? And I am totally against the use of violence. The first response is that people should not shut down peaceful political rallies in that way. The second is: Does someone like Donald Trump, who has such an extraordinary megaphone, have a responsibility for the language he uses? He certainly does. Should he stop saying the things he has been saying about Muslims and other minorities? Absolutely he should. Does that justify violence to close down his rallies? No, it doesn’t. Can you think of any situation where you think peaceful rallies should have been shut down by force? In absolutely extreme circumstances. Obviously the people who tried to assassinate Hitler are heroes. But the circumstances are extreme and truly not to be compared with the circumstances in the United States at the moment. I think there are two points to be made about that. The first is, obviously, the discussion about free speech is also a discussion about power relations. But I would argue that for the most part, free speech is a weapon of the weak, the powerless, the persecuted, against the powerful, which is why Aryeh Neier famously argued in the Skokie case that he would defend his enemies, neo-Nazi marchers. He makes this point explicitly because law and free speech are ultimately not a weapon of tyrants. Now, obviously there are exceptions to that, and I have quite a bit [in the book] about the problem in the United States, which is money speaking too loudly. How do you view the push for things like “safe spaces”? I’m talking to you from Oxford. I defended the Rhodes Must Fall movement here, which I think opened up a conversation about our colonial history, the curriculum, and so on, so I think that’s actually a blow for free speech. I don’t think trigger warnings in principle are so bad. Why not? If there is someone who’s genuinely likely to be traumatized by a particular text or film, put a warning on it. It’s been taken to absurd and extreme lengths, but some of this I think is fine. The “no platforming” and “safe spaces” argument I think is massively problematic, because when you look at it it’s not just people saying, “We don’t want to hear Germaine Greer,” which is fine, no one has to invite her. It’s one group of students saying that another group of students shouldn’t be able to hear someone they want to hear. It’s student-on-student censorship, and against that I think we really have to hold the line. You called for the Charlie Hebdo cartoons to be reprinted. Why is that a question of free speech? There’s been a lot of yielding to violent intimidation since the Fatwa on Rushdie. There’s a lot of self-censorship out of fear. So, come to Charlie Hebdo: I make that proposal. I then have incredibly interesting conversations, notably with American editors who say we’re not going to reprint this for two reasons: one, because these are grotesquely offensive, and that’s punching down. That was a key phrase, punching down, against the weak, and secondly because we’d risk the life and limb of our employees. My point is that you’re confusing two completely different considerations there. Consideration No. 1 is a consideration of taste. I would not have reprinted the Charlie Hebdo cartoons in the Guardian, or wherever, before the murders. I see absolutely no reason to do that at all, and I agree with this point about punching down and some of them were grossly offensive. Once people have been murdered in cold blood, simply for the act of drawing and publishing these cartoons, the meaning of republication changes completely and the meaning of republication is not in any way, shape, or form to endorse the artistic or political content of the cartoons. It is simply to say the assassin’s veto will not prevail. They shall not pass. And I think that part of it is really important to hold onto. I think that almost none of the places that did reprint the cartoons would have done so if the cartoons had been about black people or Jews. So perhaps those of us claiming that we speak for free speech have double standards, which may in turn make us wonder about our attachment to the principle. This is fascinating territory because one of my conclusions from the book is, tell me your double standards and I will tell you who you are. Everyone in the debate about free speech has to interrogate one’s self, so a great example I give in the book is the Anti-Defamation League, which wanted social media platforms, internet platforms, to remove Holocaust denial, even though it’s not illegal in the United States, but said that the Innocence of Muslims video should be left up. That’s a double standard, because Innocence of Muslim’s was grossly and deliberately meant to be offensive to Muslims and actually if you look at YouTube’s community standards, you could argue that they should have taken it down earlier and that once the violence happened then you would seem to be retreating in the space of violence. By the way, Charlie Hebdo cartoons were also very offensive to Jews if you remember. These are very difficult decisions, and I completely respect the second part of the argument, which says if I’m an editor or publisher, I’ve got 1,000 employees to think about, so what I actually propose as a compromise in the book, which I call the “one click away principle,” which is that everyone should publish them online. With “one click away,” no one needs to be confronted with it at the news agent if they don’t want to. I actually think that’s a pretty interesting compromise. Does this new internet era make you at all hopeful about free speech? Well, it’s the fallacy of technological determinism. I remember reading an article in 1990 called “The Facts Will Set You Free.” The facts set nobody free. People set people free, and the same is true of the internet. It clearly gives massive new possibilities for communication, and freedom of expression, but it also allows for massive new possibilities, as Edward Snowden amongst other showed us, of surveillance and control. Do you have more fear about freedom of speech being curtailed by governments or from big internet companies? Amongst others. I think that, having lived through a period of liberal triumphalism, where one could plausibly see free speech spreading in the 1990s, early 2000s, we are now on the defensive. It’s no longer just a state. It’s not just states and censorship. It’s also private superpowers, the big giants, be they American or Chinese, and most dangerous of all is what I call “power squared,” when the governments and the internet giants collaborate without any transparency or accountability. So if I had to point to the biggest single threat to free speech, I think it would be the covert collaboration between the public and the private superpowers.